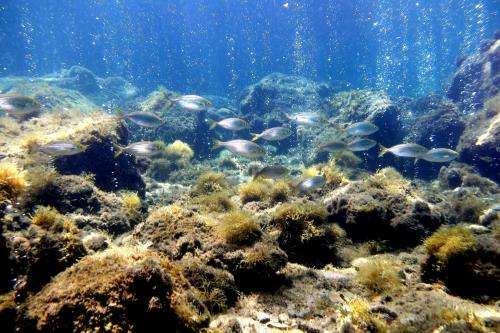 A study into marine life around an underwater volcanic vent in the Mediterranean, might hold the key to understanding how some species will be able to survive in increasingly acidic sea water should anthropogenic climate change continue. Researchers have discovered that some species of polychaete worms are able to modify their metabolic rates to better cope with and thrive in waters high in carbon dioxide (CO2), which is otherwise poisonous to other, often closely-related species. The study sheds new light on the robustness of some marine species and the relative resilience of marine biodiversity should atmospheric CO2 continue to cause ocean acidification. A team of scientists led by Plymouth University, and including colleagues from the Naples Zoological Station in Ischia; the Marine Ecology Laboratory ENEA in La Spezia, Italy; the University of Texas Galveston; and the University of Hull, conducted a three-year research project into the potential mechanisms that species of worm polychaetes use to live around the underwater CO2 vent of Ischia in Southern Italy. The researchers collected specimens found in waters characterised by either elevated or low levels of CO2, and placed them in specially-constructed 'transplantation chambers', which were then lowered into areas both within and away from the volcanic vent. They monitored the responses of the worms and found that one of the species that had been living inside the CO2 vent was physiologically and genetically adapted to the acidic conditions, whilst another was able to survive inside the vent by adjusting its metabolism. Project leader Dr Piero Calosi, of Plymouth University's Marine Institute, said: "Previous studies have shown that single-cell algae can genetically adapt to elevated levels of carbon dioxide, but this research has demonstrated that a marine animal can physiologically and genetically adapt to chronic and elevated levels of carbon dioxide. "Furthermore, we show that both plasticity and adaptation are key to preventing some species' from suffering extinction in the face of on-going ocean acidification, and that these two strategies may be largely responsible to defining the fate of marine biodiversity." The results revealed that species normally found inside the CO2 vent were better able to regulate their metabolic rate when exposed to high CO2 conditions, whilst species only found outside the CO2 vent were clearly impaired by acidic waters. In fact, their metabolism either greatly decreased, indicating reduced energy production, or greatly increased, indicating a surge in the basic cost of living, in both cases making life inside the vent unsustainable. Dr Maria-Cristina Gambi, of the Naples Zoological Station in Ischia, explained: "Despite some species showing the ability to metabolically adapt and adjust to the extreme conditions that are found inside the CO2 vents, others appear unable to physiologically cope with such conditions. ''In this sense, our findings could help to explain mass extinctions of the past, and potential extinctions in the future, as well as shed light on the resilience of some species to on-going ocean acidification." The team also found that those species adapted to live inside the CO2 vent showed slightly higher metabolic rates and were much smaller in size – up to 80% smaller – indicating that adaptation came at a cost of energy for growth. Dr Calosi concluded that: ''Ultimately, species' physiological responses to high CO2, as those reported by our study, may have repercussions on their abundance and distribution, and thus on the structure and dynamics of marine communities. This in turn will impact those ecosystem functions that humans rely upon to obtain goods and services from the ocean." The research was funded by a Natural Environment Research Council UK Ocean Acidification Research Programme grant, and an Assemble Marine EU FP7 scheme, and is the first of its kind to bring together both the physiological and genetic evidence for adaptation to elevated pCO2 in a multicellular organism. The findings are published in the Philosophical Transactions of the Royal Society B, online on the 26th of August 2013. More information: Calosi, P., Rastrick, S.P.S., Lombardi, C., de Guzman, H.J., Davidson, L., Jahnke, M., Giangrande, A, Hardege, J.D., Schulze, A., Spicer, J.I., Gambi, M.C., 2013. Adaptation and acclimatisation to ocean acidification in marine ectotherms: an in situ transplant experiment with polychaetes at a shallow CO2 vent system. Phil. Trans. Roy. Soc. London B special issue Ocean Acidification and Climate Change: Advances in Ecology and Evolution. Doublespeak: "...or greatly increased, indicating a surge in the basic cost of living, in both cases making life inside the vent unsustainable." If the critters grew faster without the benefit of even a single not to mention dozens of year long generations to adapt towards to the *much* higher CO₂ concentration they originally evolved in, it "indicates" an "unsustainable" increase in the "basic cost of living" despite despite their now reported "marked physiological plasticity." Why check actual trends so far when you can just "indicate" your grant endorsing conclusions? Try working here in the face of massive ocean fertilization: "Plymouth has embedded sustainability across its operations, and is the overall best performing university in the People & Planet Green League." "At low pH, coralline algae survived by increasing their calcification rates. However, when the change to low pH occurred at a fast rate we detected, using Raman spectroscopy, molecular bonding weaknesses in the calcite skeleton, with evidence of molecular positional disorder." But what is *really* happening to algae abundance in our high emissions era as oil and coal use release long buried nutrients into the biosphere? Bonus question: Do "molecular positional disorder" or "molecular bonding weaknesses" pass the laugh test? Google them in quotes! Why won't science after 28 years of threats of a "possible" death for the planet finally agree it is inevitable instead of just possible and end this costly debate that is taking us closer the point of no return from unstoppable warming? Science's own "maybe" consensus is what fuels denial and anti-CO2 mitigation, not big oil. Since science has never said it WILL happen, how do you believers get away with saying it? This is pretty much what was said before. Rats and cockroaches. Enjoy your neighbors.